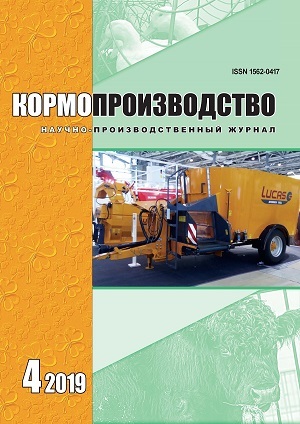 The paper describes the role of corresponding member of the All-Union Academy of Agricultural Science M. A. Smurygin in research development in the field of fodder and forage resources as well as in practical application of scientific achievements. Effective scientific background of agricultural production branch requires professional personnel having good experience, promising intellect and ability to work in teams. Such a person was Mitrofan Andreyevich Smurygin. Being both good organizer and scientist he worked as a head of the All-Russian Williams Fodder Research Institute for 20 years (1967-1987). In short time Smurygin could restore team creativity by Institute structure optimization and new personnel recruitment and use it to achieve goals of government new agrarian politics. His work resulted in developing highly productive haylands and pastures among different Russian regions, including irrigated and non-irrigated, arid and semi-arid lands; theoretical background of fodder preservation; scientific background of intensive forage production including plant protection and nutrition; high-productive varieties and improving methods of plant breeding and seed production. He employed both experienced and young scientists to succeed in research conducting and provided them with proper conditions for scientific work and creativity. Keywords: the All-Russian Fodder Research Institute, fodder production, research, research planning, material and technical resource, prototype network, coordination, international cooperation, personnel. The paper deals with lawning in Russian humid subtropics. Most lawns in this region are in a bad condition. It is a result of roll lawn usage or seeding plant material which is not adapted to the regional conditions as well as inappropriate agrotechnological techniques. Traditional grass mixtures include Lolium perenne L., Poa pratensis L., Festuca pratensis Huds., Festulolium sp., Bromus inermis Leyss., Agrostis stolonifera L., Phleum pratense L., Dactylis glomerata L. etc. In recent years lawns are reported to contain various types of annual, biannual and perennial weeds. Some of them are not typical for the region which presumably remained in a soil imported. Additionally, grasses of roll lawns are infected by rust diseases and powdery mildew. Improving lawn quality requires adapted assortment of gramineous. Poa angustifolia L., Festuca rubra L., Agrostis stolonifera L., Festuca arundinacea Schreb., Cynodon dactylon (L.) Pers. and wild types of gramineous are recommended to be used for lawning. Good alternative to traditional lawns can be Liliopsida plants (Liriope, Ophiopogon, Reineckia genera) as well as a number of grasses and ground-covering shrubs. Keywords: lawn, gramineous, weed, lawning technology, humid subtropics. The paper studies the effectiveness of different rates of P-fertilizers (50, 100, 150, 200 kg ha-1) on the background of NK (90 kg ha-1) considering different soil acidity. The soil is sod podzolic with medium amount of loam. The research included rotation of grain crops, fallow and perennial grasses and used winter rye, spring wheat, clover and oats. Efficiency of mineral fertilizers is strongly dependent on environment, soil fertility and crop biological traits as well. Among all crops winter rye yielded the best — 4.92 t ha-1 (acidic background) and 5.12 t ha-1 (alkaline background). Oats’ productivity on the alkaline background made up 4.28 t ha-1 on the average, which is 0.38 t higher than on the acidic background. Fertilization increased feed units’ yield per 1 ha: up to 4.21 t — on acid soil under the maximum phosphorization and 4.84 t — on alkaline soil under annual N90Р50К90. Crude protein content amounted to 683 kg in this variant which is 60 % higher than on unchalked soil. Experiment planning revealed the influence of environment on winter rye productivity and macronutrient content in grain. Soil pH and content of К2О affected the most N content in grain of winter rye. Keywords: mineral fertilizer, chalking, soluble phosphorus, sod-podzolic soil, productivity, crop rotation, crude protein, environment. Winter rye (Secale cereale L.) occupies huge territory in Russia. It shows good tolerance to soil and climatic conditions. The grains contain high amount of water- and salt-soluble proteins which are rich in lysine concentration. Nevertheless, using rye is not widely used in livestock feeds because of certain limits. One of the problems is high concentration of water-soluble pentosans which has an ability to form a highly viscous solution. It depresses digestive enzymes activity affecting negatively fodder digestibility. Breeding varieties with low pentosans’ concentration is of high interest for plant breeders. The paper deals with data on winter rye variety “Yantarnaya” having low pentosans’ concentration. The experiment took place on Ural Research Institute of Agriculture (store pigs from crossing Yorkshire and landrace breeds) and Agricultural Complex “Gornouralskiy”, Ltd (Yorkshire pigs). Feeds for experimental group contained 20 % of “Yantarnaya” grain meal. As a result from this feeding pig average daily weight gain increased, meat quality improved; no gastric distress being revealed. It also led to reduction of financial expenses by 11.5 %. It was concluded that grain of “Yantarnaya” can be used in pig feeding. Keywords: winter rye, variety, “Yantarnaya”, water-soluble pentosans, feeding, pig, forage. In the forest steppe of the Volga region maize is the leading crop which is tolerant to frequent drought. Unfortunately maize productivity decreased sharply in the period of drought; severe drought resulting in huge crop losses, which happened in 2010. Obtaining broad assortment of forage crops to be cultivated is a promising practice in the arid zones. One of the drought-resistant crops is sorghum (Sorghum sp.). Sorghum was not widely cultivated in the republic of Tatarstan until 1990th because of the lack of the varieties and hybrids displaying high intensity of the initial growth. Now it is necessary to study sorghum cultivation specialties and make appropriate recommendations to this process. The appearance of novel varieties and hybrids, fertilizer rates’ calculation system, main and secondary tillage practices as well as new standards and methods of seeding supports this need. Keywords: sorghum, green mass, feed unit, variety, seed, technology, preceding crop, fertilizer, sugar. The paper deals with the competitive testing of forage sorghum and maize sown as monocultures or mixtures with soybean and amaranth. The crops were cultivated on the dark chestnut soils under dryland farming conditions in the southern steppe of Ukraine. Experiment conducted in the period from 2011 to 2013 included three factors: A – intermediate and late varieties of forage crops (maize “Krymskoe-15” and “Agrarnyy-5”; sorghum “Etyud” and “Odesskiy-385”); B – maturity group and C – companion crop. All three years of the research were characterized by unfavorable growing conditions. The research aimed at studying productivity of sorghum and maize cultivated as monocultures and mixtures using their biological characteristics more effectively and increasing their tolerance to regional climate changes. Mixtures of forage sorghum with soybean and amaranth provided the most nutritionally balanced high quality fodder (3.60–3.91 feed units) under no irrigation. Intermediate sorghum “Krymskoe-15” yielded better than late sorghum “Agrarnyy-5” both as monoculture (17.2 и 15.7 t ha-1) and in combination with amaranth (17.4 и 16.9 t ha-1respectively). Forage sorghum of different maturity groups gave better green mass yields and provided livestock with feed more constantly during the growing season compared to maize. Keywords: forage sorghum, maize, feed unit, protein, productivity, energy content, drought. In the Sverdlovsk region, winter triticale is a promising crop for obtaining high quality feed grain for cattle, pigs, and birds. High productive potential of triticale varieties provides 6–8 t ha-1 of grain in field trials. Most of studied triticale varieties had grain with the first-class crude protein content — 144–170 g/kg of dry matter. Also the exchange energy content was the first-qualified: for cattle — upwards of 13.2 MJ/kg of dry matter, for pigs — 16.0 MJ/kg, for birds — 14.2 MJ/kg. In hot and dry weather, the crude ash content of triticale grain was at the second and the third grades. In warm and humid weather, it was decreased and grain graded to the first and the second classes of quality. Under drought conditions, the starch content in triticale grain was lower than in wheat and rye grain; at sufficient precipitation, it was significantly higher — more than 30 %. In the Ural Agricultural Research Institute new triticale varieties were bred: shortened high productive variety ‘Istokskiy 1’ for grain usage, and tall variety ‘Uralskiy kormovoy 1’. The nutrients and exchange energy content of these varieties’ grain matched with the first and the second classes. These varieties are suitable for cultivation for feed in the Central Ural. Keywords: variety, breeding, winter triticale, nutrients, exchange energy, feed quality. The paper of Kashevarov N. I. “Problem areas of agriculture and forage production” contains numerous scientific, statistical and expert materials on forage regarding the aspects and ways of agriculture development. In 1990-1998 Russia showed breakneck fall in agricultural production. Production index in agricultural sphere generally reduced by three times, for Animal Husbandry – by 49.1 % and for Crop Production – by 25-30 %. In Siberia area to be cultivated amounts to 52.3 million ha or 2.2 ha per every resident including 1.0 ha of fields. Total area of farm lands includes: fields – 48 %, grasslands – 33 %, hayfields – 16 % and fallows – 3 %. Factors leading to unstable fodder production are: ignoring management systems, drastic reduction in fertilizer rates, decommissioning irrigation and drainage systems, terminating natural forage lands’ cultivation, increasing percentage of long-term perennial grasses, severe decrease in lands for silage crops, destructing perennial grasses’ seed production system, disregarding technologies of fodder conservation and storage, insufficient amount of resources, lack of personnel and shortage of statistical data on forage production. Improving efficacy of agriculture and forage production requires reasonable use of land resources, optimization of crop location structure etc. Effectiveness of agriculture and forage production is highly dependent on Agricultural Science status.